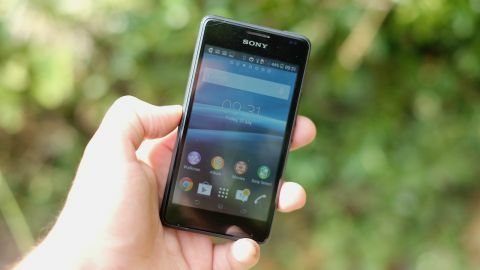 The Sony Xperia E1 is not the best phone you can get for under £100, much as Sony may claim it as best-in-class. It's small and convenient but performance issues mean there are better options out there. The Sony Xperia E1 is a cheap phone – about as affordable as Sony makes. It's small, doesn't have all that many cutting-edge features and can't afford to be quite as stylish as its big brother the Sony Xperia Z2. However, there are benefits to a phone like this. As it is not covered in glass you don't have to worry so much about it shattering should you drop the thing. And even if something bad does happen to the little Xperia E1, you won't have to cry for too long. You don't need to take out a mortgage to buy one of these. It slots in right at the bottom of Sony's Android Xperia range, below the Sony Xperia M2 and the top dog Xperia Z2. There's quite a lot of competition in this just-under-£100 area, though. The pick of the bunch is the Motorola Moto E, a phone that doesn't quite have the brand credibility of the Sony Xperia E1 but really does ace the basics better than the E1 – the screen, the body, general performance. Sometimes rejecting the biggest brands pays off. But how much will you really have to pay for the Sony Xperia E1? SIM-free the phone can be found for around £85 (about US$139, AU$149). A PAYG model will set you back around £80 (about US$136, AU$144) . If you want to pay monthly then the phone is free for as little as £8.50 (about US$14, AU$15) a month. However, phones like this really make more sense as mobiles to buy outright – on contract you might as well pay a tiny bit extra to get a higher-end device. The Xperia E1 (middle) is smaller and cheaper than the M2 (right) but is it a bit of a lemon? There are no different varieties of Xperia E1 to worry about when buying. The phone just comes in one flavour – 3G with 4GB of internal memory. It does come in white, purple or black shades, but the actual hardware is the same. Sony's higher-end phones are some of the slickest mobiles around – even the fairly affordable Xperia M2 has the same sophisticated glassy look as Sony's top-end Xperia Z2. However, the Sony Xperia E1 is a lot more conventional. There's no glass (or glass-look) rear here. The back is the same sort of curved, removable plastic battery cover seen in most budget mobile phones. At 12mm (0.47inch) thick, the Xperia E1 is a chubby phone, but it is still little. As it has a pretty small 4-inch screen, carrying a little extra weight isn't really an issue. The phone is very easy to use in one hand thanks to its small stature and I can't imagine even kids' hands having too much trouble with the phone. This kind of ergonomic accessibility is great, but the Sony Xperia E1 does feel quite cheap. Where Sony's other mobiles put a lot of effort into feeling high-end, the roughly textured finish here doesn't impress the fingers, and a few rough design edges don't impress the eyes either. Things like the camera lens being clumsily recessed behind the battery cover, the rather over-egged speaker grille on the back and that the textured finish goes a bit shiny with wear show the Xperia E1 up. It doesn't look or feel more expensive that it is. There are some little extras some of you might appreciate, though. Like Sony's old Walkman phones, the Xperia E1 has a dedicated music button up top. Hold it down and it launches the music player app. It can also be used to control music playback while you're listening, like the remote control seen on many pairs of headphones. Are headphone remotes more useful? Yes, absolutely, but I do think the Xperia E1 button will come in handy for those who like to hold their phone while going out for a run. I've said that the Sony Xperia E1 doesn't share a great deal design-wise with the higher-end Sony phones, but you do get the Sony-staple Omnibalance power button. This is where the button is placed slap-bang in the middle of the phone's side for easy access. In a phone this small you could pretty much put the button anywhere, but it's handy nevertheless. The phone's back pops off pretty easily too, and gives you access to the battery, the full-size SIM slot and the microSD slot. You get just 4GB of internal memory, less than a gigabyte of which is ready for you to play with. If you want to put more than a few music tracks on the Xperia E1, you'll absolutely need a memory card. We'll see lots of little cuts like this in the Sony Xperia E1, and some of the clearest are seen in the screen. The phone has a 4-inch 480 x 800 pixel display, giving 233ppi pixel density. That's not enough to give you the kind of supreme sharpness of more expensive phones, giving text a slightly rough look. This is pretty much the standard at the price, although the Motorola Moto E does get you a significantly sharper screen. Contrast and colours are pretty good for such a low-end display, but a few other aspects leave the Sony Xperia E1 screen as nothing more than just OK. First, it doesn't use an IPS panel, and as a result viewing angles are pretty average. The screen also appears recessed and lacks the anti-reflective design needed to make using a phone outdoors remotely fun. Top brightness is a fair bit better than some at the price, though, so the Sony Xperia E1 shouldn't make you want to throw it against a brick wall as soon as the sun comes out. One other pretty rubbish element of the screen is what it's made of. Phones over £100 often use Gorilla Glass 3 for their top screen layer. It offers great scratch resistance and a lovely super-hard surface. Sony says the Xperia E1 has a glass top layer, but on first using it I assumed it was plastic. There's a good deal of flex to the screen, giving it a slightly spongy feel and causing screen distortion should you press down too hard on the display. It doesn't feel as nice to use as the Motorola Moto E, which does use Gorilla Glass for its screen.